Manage multiple country TLDs or have a clear policy regarding country/language policy for a primary domain. This post is written for a Fortune 2000 companies that are not in retail. Retail websites that list consumer-centric products have a different set of rules to follow. 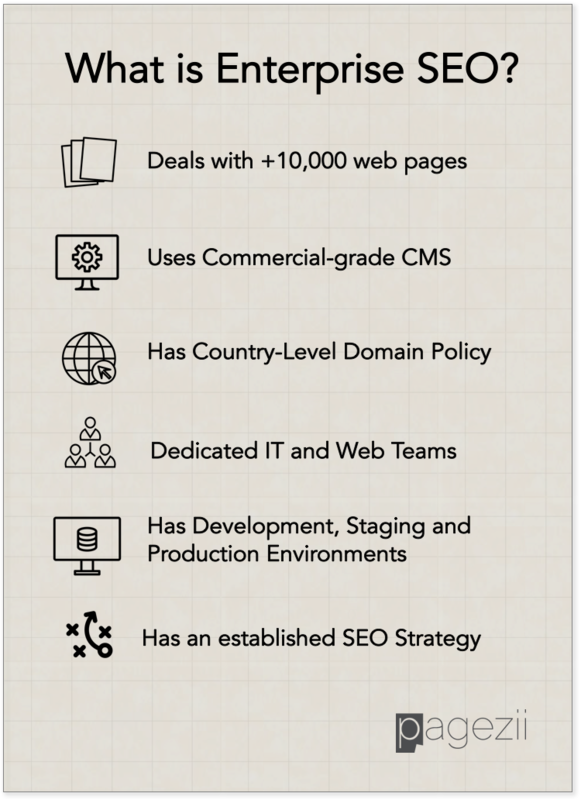 Relies on dedicated IT and Web-dev teams. 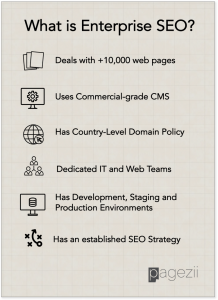 Has an established SEO strategy. If your company has all of the above hallmarks for Enterprise SEO but is missing the strategy component, you’re at the right place. An Enterprise SEO Strategy is made up of six aspects. As an SEO Manager, you can use this framework to optimize a large set of site content. Let’s break down the mechanics of the Enterprise SEO strategies. A site-wide audit maps out optimization steps moving forward. It highlights pages performing well in search engines and what pages need improvement. Use this information to set up an SEO game plan for boosting your page’s rank. Average site SEO: Analyze your site and find a benchmark you want all your content to pass. Start optimizing content from the lowest performing pages upwards. High-Value Content: Prioritize content to optimize by value. These two techniques give your SEO team possible routes optimization. If high-value content is well-optimized, start working on low performing pages. If top pages need SEO improvement, then focus your efforts on that content. 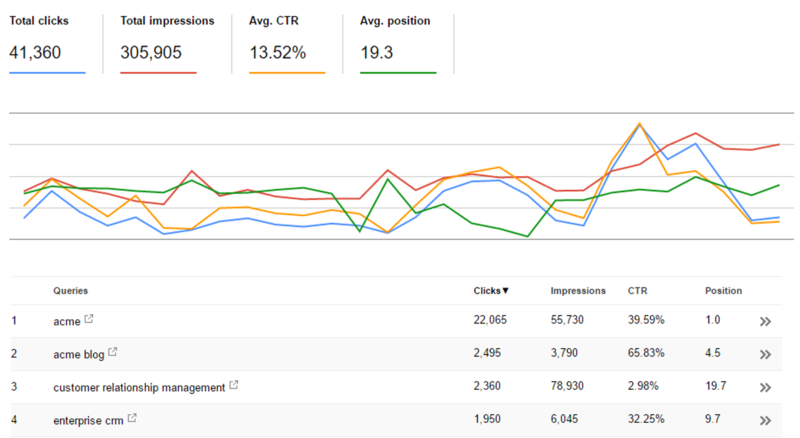 Your site audit shows you possible optimization paths, now analyze search queries driving site traffic. This your team valuable search terms. It also opens the door for new keyword opportunities to implement in your strategy. Clicks: This highlights keywords that bring in visitor traffic. This means users searching for this term landing on your site most often. Impressions: High impressions indicate a popular search term. You can use this information to take advantage of a keyword if it makes business sense. Click-Through Rate: higher click-through rates mean user search intent aligns will with your site content. Again, you can use this data to take advantage of keywords. Position: position shows how your content stacks up in the search engine market. If you’re not on page one for a valuable keyword, you have an idea of what to optimize. Now that you and your team have a solid understanding of organic keywords, look at how competitors are performing in search engines. Your competitor analysis benchmarks your site’s SEO performance against other industry players. This is the final step of the research process. It’s a good strategy to segment competitor analysis by keyword. You’ll also want to track keyword rank changes over time to show performance gain or loss. Your competitor analysis shows how your industry is optimizing for valuable keywords. This guides your Enterprise SEO strategy and lays the groundwork for success. It’s now time to start optimizing your site. This is where you’re going to put your site audit information and organic keyword analysis data to use. Based on the optimization path your team will take (optimizing lowest performing pages vs high-value pages), apply your organic keyword research. As an Enterprise site, this may require you to optimize hundreds of pages. Get started by optimizing on page elements that will have an immediate impact on SEO performance. These elements include page title, description, and body. Pagezii Tip: Learn how to optimize key on page SEO elements with the On Page SEO Checklist. Your Enterprise blog and social networks bring in site traffic. Make sure your industry can easily find your content in search engines. Look at your blog’s average SEO score. Your SEO team can use this metric as a yardstick for optimization. Focus on optimizing posts performing below average blog SEO score. This is going to increase your visitor traffic and boost overall SEO for your site. The last stop in your Enterprise SEO strategy the analytics review. This shows if your optimization efforts are translating into business value. 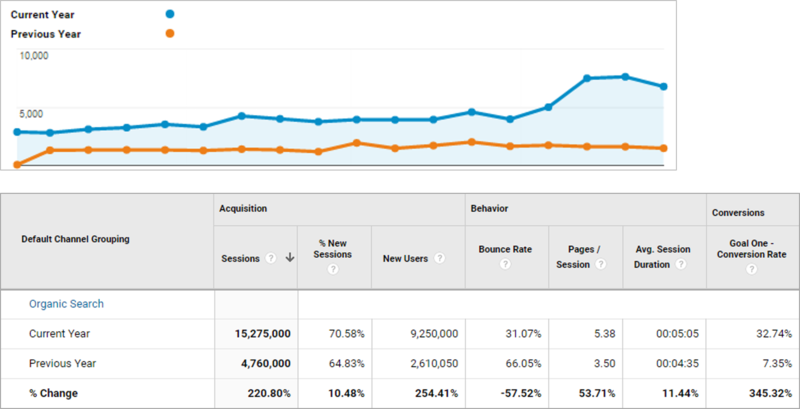 Use web analytics software such as Google Analytics to compare performance. You can judge performance trends using different performance indicators. High Visitor Traffic: Look for acquisition increases. This means higher session and new users. Site Engagement: Analyze behavior metrics. Look for lower bounce rates and higher pages per sessions and session durations. ROI: Look for spikes in conversions. Conversions are the driving force behind marketing efforts. Enterprise marketing calls for a scaled SEO strategy. Your strategy should analyze your site SEO and how your industry is using search. From there, you can begin to optimize site pages and visitor traffic content such as blog posts. Finally, look at your how your efforts have resulted in business value. If you’re seeing positive website performance, your strategy has worked. Interested in Enterprise SEO? Download the Enterprise SEO Checklist designed for SEO Managers to improve search engine processes.